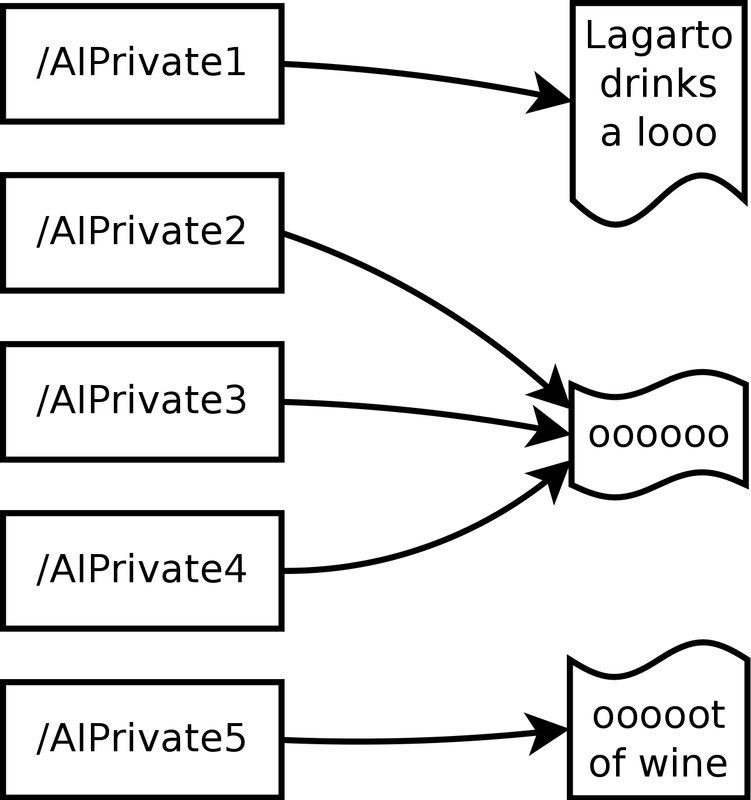 The metadata needed for representing this image in memory consumes near 0x100 bytes extra. We need to ask for a little less of pixel data (128x8190 = 1048320 bytes) in order to get the desired rounded megabyte. 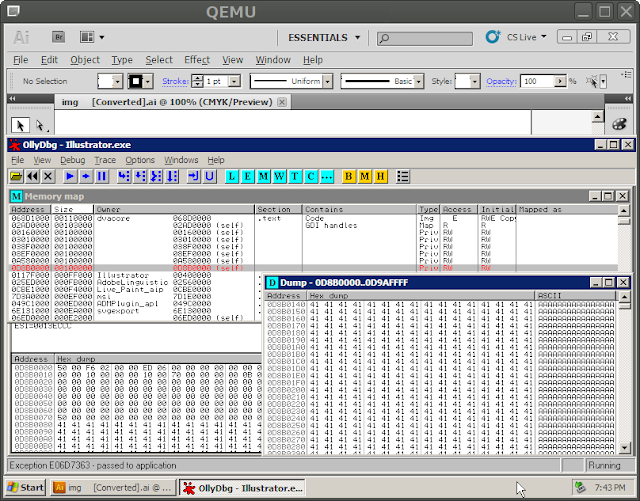 A screenshot of a debugging session of Illustrator after opening a file like this follows. 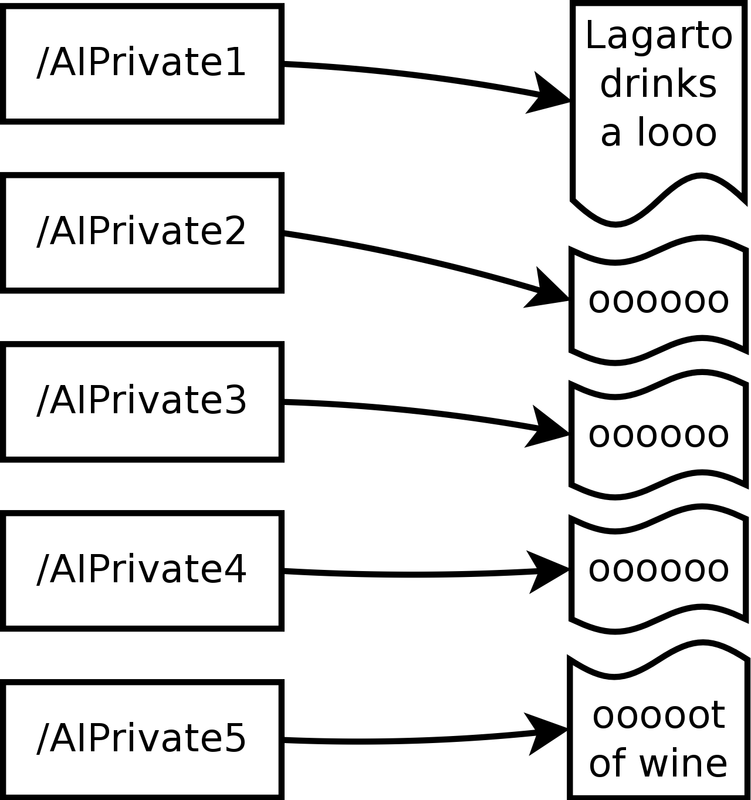 Note that at the beginning (and also at the end) of the VirtualAlloced memory there is a bit of memory (0x80bytes) of uncontrolled metadata, this won't affect much a normal heap spraying scenario. A ready to try python script that generates such a file is here, and the example AI/EPS file is here. 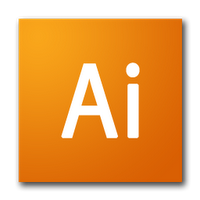 The simplest way to spray the Illustrator memory is to repeatedly include one of this images. It could be interesting to analyze the factibility of using a postscript 'for' or 'repeat' statement for this task, though we haven't went that way, instead we use the PDF way. 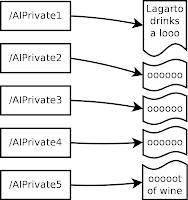 The PDF /PieceInfo key in a /Page dictionary points to the Illustrator private data. If present Illustrator uses this private data to render the illustration and try to parse the normal PDF page contents otherwise. PDF Reader opens the page content and ignore the Illustrator/private bit. An exploit for illustrator doesn't affect the Reader, and in fact exploits for one and the other can co-exist in the same PDF/AI file. C1...C100 are PDF streams holding chunks of the postscript illustration. As the data is contained in PDF Streams, all the compression facilities available in the PDF format become available for free. For example and most notably: deflate compression. 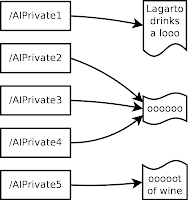 Several /AIPrivateData references can point to the same PDFStreams. This way repetitions in the postscript data can be arranged so they are repeated using several references to the same stream. This saves saving a lot of space. PDFREFX here are PDF referesnces to indirect objects/streams like "R 0 10" and we can simply make it point to the same object. In order to obtain a nice spraying .ai file we first compile a near 300M AI private postscript file with 300 images of 1Megabyte each inside. This will fill the memory as expected but it has the drawback of being huge. To compress it to a manageable size it is divided in 64k chunks, deflated and put into PDF streams always reusing recurrent chunks. The resulting .ai file is a 300M memory spraying PDF/AI file that only weights ~500k. As the size is already reasonable we have ignored this but bear in mind that other partitions of the original private data can easily provide better compression than the trivial one. This python script used to construct this heap spraying files . It's easily configurable from the command line. spray with a lot of "X"
The default action is to output an "X" heap spraying .ai file to stdout. The resultant file will fill 300 megabytes of memory with the character 'X'. The script will construct the image so the the 0x1000 bytes chunk is repeated several times until it fills each megabyte. It also will play well with the 0x80 bytes of metadata so we can predict with great deal of probability what is under a selected address like 0x18EB0090. Here there is a screenshot of Adobe Illustrator under the debugger when sprayed. 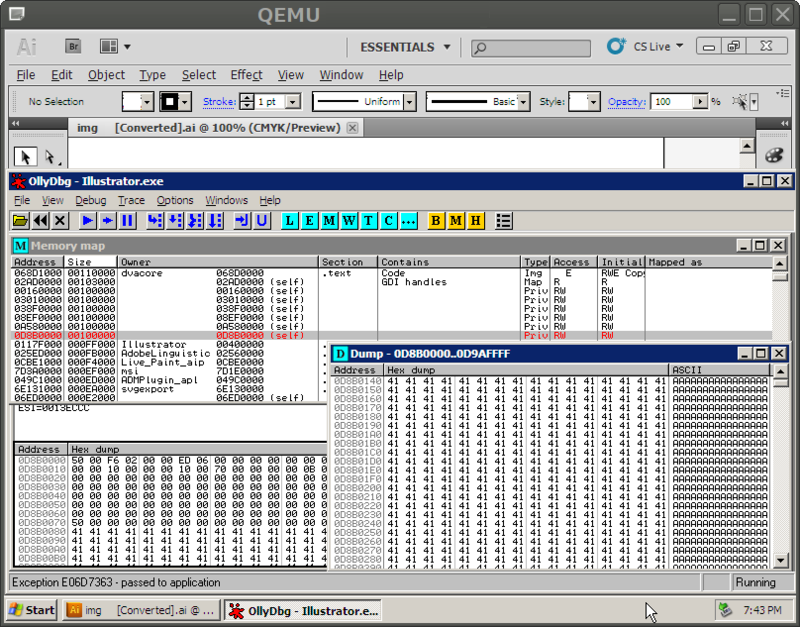 Note the are several 0x10000000 sized memory maps. Any nice OS would try to put each map consecutive to the previous to prevent fragmentation. Where the OS will accommodate the pack of 300 different 1Megabyte maps is the only source of unreliability. 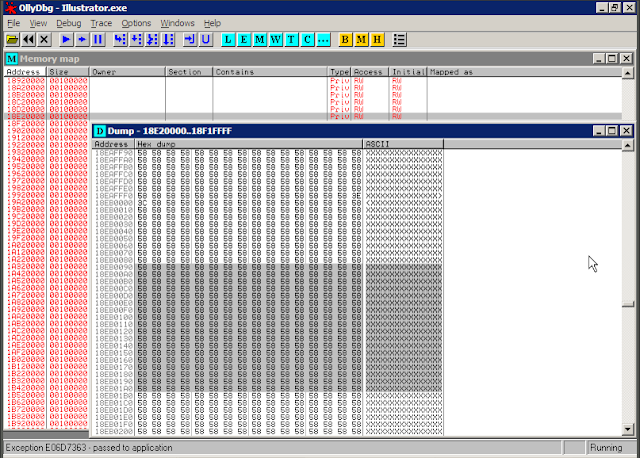 At 0x18EB0090 there is the 0x90th byte of the 0x1000 bytes chunk. Question: Does the address 0x18EB0000 have the same chance than 0x18EB0090 of being controlled?